$custId, $invId, $prodId, [int]$value = $StringToParse -split "_"
Get-ChildItem -Path "IIS:\Sites\Default Web Site"
Note that $Host.Version and (Get-Host).Version are not reliable – they reflect the version of the host only, not the engine. PowerGUI, PowerShellPLUS, etc. are all hosting applications, and they will set the host’s version to reflect their product version, which is entirely correct. Get-Host or $PSVersionTable. As Andy Schneider points out, $PSVersionTable doesn’t work in version 1; it was introduced in version 2. PowerShell 2.0 doesn’t support side by side installations with 1.0, but 2.0 is back-wards compatible with 1.0. To determine if PowerShell is installed, you can check the registry for the existence of HKEY_LOCAL_MACHINE\Software\Microsoft\PowerShell\1\Install and, if it exists, whether the value is 1 (for installed), as detailed in the blog post Check if PowerShell installed and version. To determine the version of PowerShell that is installed, you can check the registry key HKEY_LOCAL_MACHINE\SOFTWARE\Microsoft\PowerShell\1\PowerShellEngine\PowerShellVersion. PowerShell is a new scripting language that allows you to interact with applications, services and objects as objects. It is a .NET application which shells commands out on your behalf. This is very powerful, because it allows you to leverage the strengths of an object oriented model within your scripting tasks with a very terse, yet simple scripting language. Because it is written in .NET, you can access .NET types, objects and WMI objects from a command prompt. My current workstation runs Windows Server 2008 Standard Edition with Hyper-V. I use the host/parent partition as my office, and have a number of child partitions that are integrated into a Windows Server 2008 Domain. Needless to say, this configuration gives me everything I need to develop, test and integrate multiple Server OS’, platforms and technologies, and is my environment of choice for developing production code. It still amazes me how far we’ve come in such a short period of time. Not too long ago, I remember setting up similar lab environments at home running Windows NT 4 and Windows Server 2000 on dedicated physical machines. Anyway, I have to say that I am absolutely delighted with my environment, but it took me some time and effort to learn how to tune Server 2008, and this is all well documented in previous posts. One of the the things that I do to keep performance high is that I only have the 3 services required for Hyper-V running when I need them. In other words, if I am only working with email and writing documents or design drawings, I don’t need to have the Hyper-V services running because they are resource intensive. In addition, I only want my loopback adapter (that provides me with a virtual LAN for all of the child partitions on my domain to communicate) enabled when I need it to be. One reason for this, is that if I leave my loopback on and reboot, boot times can take up to 10 minutes because the loopback is configured to use my domain controller as the primary DNS server, which is a VM. Because the DNS Server only runs when my Domain Controller VM is up and running, the VM will only come up when I start it. As a result, Windows tries and tries to reach the DNS server for the Loopback adapter until it finally gives up (If anyone knows how to change this timeout, please shoot me a note or post a comment). The service names are a bit obscure, but the "friendly" names are pretty self explanatory. When I need to start my development environment, I would go into Server Manager, and start each service one by one. 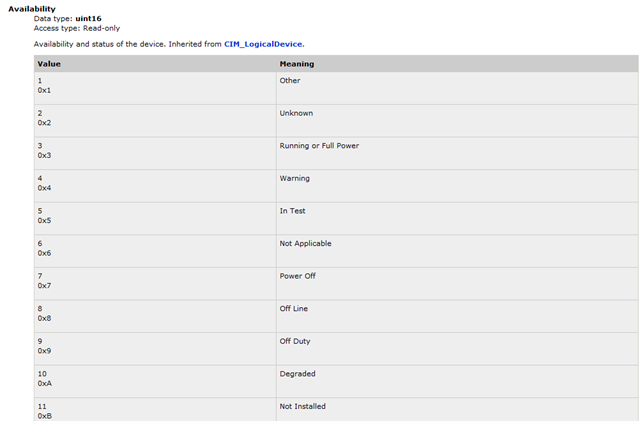 Next, I would enable my loopback adapter so that my child partitions can communicate with each other. All together, this resulted in a number of clicks, which was somewhat mundane to do every time. Worse, once I enabled the loopback, I often would forget to disable it before shutting down (remember, servers running Hyper-V do not support hibernation). For a while, I thought about writing myself a sticky note and posting it to my forehead so that I would not forget to disable the loopback, and finally, I decided to create an easy button for starting and stopping my development environment. This is where Powershell comes in. The value of the Availability property is 3. 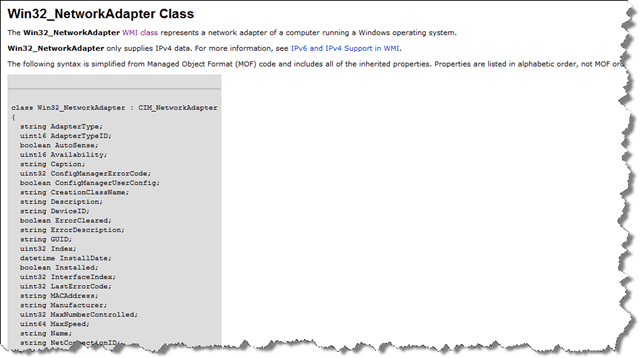 Referring to the WIN32_NetworkAdapter documentation, I can see that a status of 3 indicates that adapter is on, and running on full power. Are you getting the hang of it yet? Hopefully, the interaction with PowerShell should feel object-oriented because it is! We are getting a reference to the WMI shell of the adapter and then using it’s get accessors to get the value of the public properties. So, if we can get a reference to the adapter, get properties, we should be able to call methods on it, right? As you can see, PowerShell is a very easy to use, yet powerful tool for managing system objects in an object-oriented manner. You don’t need to worry about writing VBScript or C# to accomplish simple administrative tasks such as enabling and disabling a network adapter. As you might imagine, the real power comes in being able to run a series of PowerShell commands in a batch, perhaps at the click of the button. This is exactly what I’ll cover next. You’ll recall that I only want the 3 Hyper-V services to run when I need them, so what I want to do is create an "easy button" to toeggle my development environment on and off. I’ve already covered how to manage network adapters using PowerShell as a primer, so I’ll jump right into working with Windows Services. As with any program, sometimes it is helpful to group commands into a subroutine. 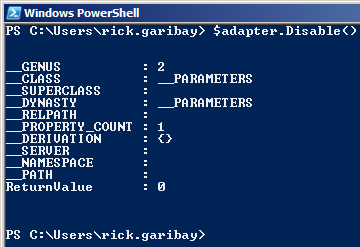 In PowerShell, these functions are referred to as cmdlets (prounounced "commandlets"). You may not realize this, but you’ve already been working with cmdlets if you’ve tried the commands I covered above on your own machine. The get-wmiobject command is actually a cmdlet that provides a reference to the WMI object specified as the parameter. You could accomplish this without the cmdlet, but why would you want to? Fortunately, a cmdlet is also available for working with Windows Services: get-service. To get information about a particular service, simply call get-service with the service name. The actual service name of the Hyper-V Virtual Machine Management service is "vmms", so issuing the get-service vmms command returns a few properties including the Name, DisplayName and Status of the service. Next I created two desktop shortcuts, appropriately named "Start" and "Stop" and set the target to each corresponding file. Now, I have two "Easy Buttons" for toggling my development environment on and off. While I can’t guarantee that I won’t forget to press the "off button" before shutting down, it is a heck of a lot easier than going through the contortions manually. Useful when troubleshooting things like group policy, scripts or any other sources that may change privileges from what they should be. May generate a hash from this and automate a quick hash difference to monitor changes to privileges on systems. "secedit.exe", "/export /areas USER_RIGHTS /cfg $file"
$sids = $sids.Trim() -split ","
$readableNames = $readableNames + $readableName.Value + ","
$readableNames = $readableNames + $readableName + ","
The Get-SPBusinessDataCatalogMetadataObject command gets a Model object by its name and saves reference to it in the $model variable. The Model object is relevant to your web application accessible through the url http://yourWebAppUrl. As its name implies, the Remove-SPBusinessDataCatalogModelmethod removes the received model using the $model variable. -Confirm:$false allows to skip an YES/NO confirmation arising right before a model is deleted indeed. Remember that the operation isn’t reversible, use the -Confirm:$false with precaution. The first command, Get-SPBusinessDataCatalogMetadataObject, returns and saves in the $metaStorevariable a Catalog metadata object relevant to your web application accessible through the url http://yourWebAppUrl. The second command, Import-SPBusinessDataCatalogModel, imports a Business Data Connectivity Model defined in a file, path of which is indicated by the -Path key. The model is to be added to the Catalog referenced by the $metaStore and overwrites the existent version (if any) due to the -Force key. as it appears to be different from a preexisting LobSystem in the current load context. What you need to do in this case is remove the previous version of the model. In Administrative Tools folder, double click the Local Security Policy icon, expand Account Policies and click Password Policy. In the right pane double click Password must meet complexity requirements and set it to Disabled. Click OK to save your policy change. Optionally you can also choose to never let passwords expire. To do this open the Maximum password age policy and set set the value to 0. Click OK to apply the change. Download Office Migration Planning Manager (OMPM) to the machine that hosts the files. The Office Migration Planning Manager (OMPM) 2010 is a group of tools designed to help administrators during the planning and testing phases of a Microsoft Office 2010 or Office 365 deployment. If your machine does not have Office 2003 installed, which by now it probably does not, then you will also need to install the Office compatibility pack to convert the files. Use the Office File Converter (OFC) to do bulk conversions of specific Office files that are in version 97 through 2003 file formats to the Office 2010 file formats. For the OFC.exe to work there must be a [FoldersToConvert] entry in the OFC.INI file. OFC.exe will follow this path a convert all DOC and XLS files into DOCX and XLSX files. It will leave the old DOC file in the folder and create the new DOCX file right alongside. $savename = $savename + "_test1.docx"
$savename = $savename + "_test2.docx"